Onion Rijnsburger 5 is an excellent Dutch variety with uniform sized, large globe-shaped bulbs with thin necks. They have a beautiful firm straw coloured skin, pure white flesh and a good flavour. As a standard maincrop it offers excellent quality, high yields and a very good storage life: from an August harvest, they will store well throughout winter until March. Few vegetables have more uses in the kitchen or are in such constant demand than onions. Nowadays we can obtain onions fresh from the garden or out of store almost all year round from just a couple of carefully-timed sowings. Apply a general fertilizer if needed and rake the surface when the soil is reasonably dry. Tread over the area and then rake again to produce a fine, even tilth. Sow very thinly in 1.2cm (½ inch) deep drills, leaving about 25 to 30 cm (10 to 12 inches) between rows. Water very gently if the soil is dry, and cover with soil. Thin Spring-sown seedlings first to 2.5cm (1 inch) then when the seedlings have straightened up to 5 to 10 cm (2 to 4 inches) apart. Thin Autumn sown onion seedlings to about 2.5cm (1 inch) in the autumn. Further thin to about 5 to 10 cm (2 to 4 inches) between plants in the Spring. Hoe carefully or weed by hand – dense weed growth will seriously affect yield. Water if the weather is dry (not otherwise) and feed occasionally. Feed an autumn-sown crop in March. Mulching is useful for cutting down the need for water and for suppressing weeds. Break off any flower stems which appear. Stop watering once the onions have swollen and pull back the covering earth or mulch to expose the bulb surface to the sun. When the bulb is mature the foliage turns yellow and topples over. (Some gardeners bend over the tops as the leaves start to yellow). Leave them for about 2 weeks and then carefully lift with a fork on a dry day. Inspect the bulbs carefully – all damaged, soft, spotted and thick-necked onions should be set aside for kitchen use or freezing. The rest can be stored. The onions which are not for immediate use must be thoroughly dried. Spread out the bulbs on sacking or in trays – outdoors if the weather is warm and sunny. Drying will take 7 to 21 days, depending on the size of the bulbs and the air temperature..
Store in trays, net bags, tights or tie to a length of cord as onion ropes. The the skin of a white onion will give shades of orange while the skin of the red onion can be used to create a medium green, slightly lighter than forest green. Freeze the onion for ten minutes before cutting. The sulphuric compound that leads to tears will not react as quickly when it’s cold. If you forget, just light a candle, as a burning flame can burn away the sulphuric fumes. If you have just painted a room and the fumes are a little overwhelming, slice an onion in half and place it in a bucket of cold water. Leave the bucket in the room overnight. The fumes will magically dissapear (or a least be reduced a fair bit). Prior to Linnaean taxonomy the Onion family was spread over four genera. The bulb Onion, Shallot and Welsh Onion were found in the Cepa genera. Garlic was placed in the Allium genera, Leeks were listed as Porrum and the Chive was classed as Schoenoprasum, its current species name. The genus name, Allium comes from the Celtic "All," meaning pungent, the species name, cepa, is from the Roman "cepae," or onion. 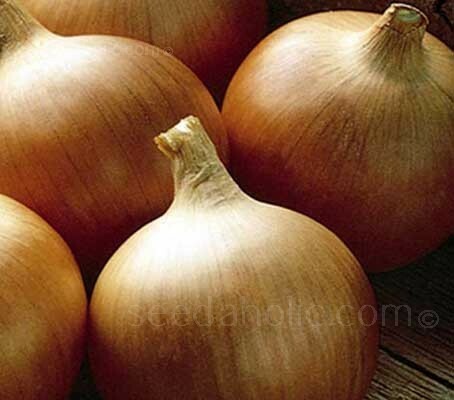 The common name onion seems to come from the Latin "Unio," or one, signifying that the bulb is of one unit. 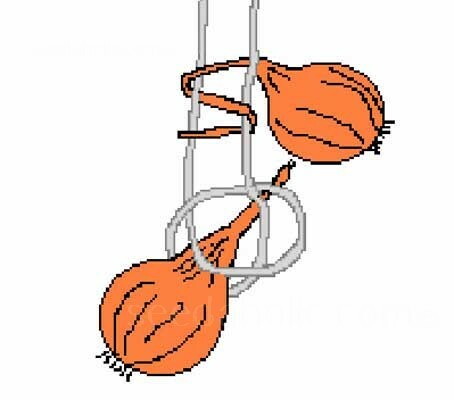 The traditional way of storing onions is to string them together and hang them up. It is quite easy to do, it stores them perfectly, they are easy to access and it looks fantastic! The key to keeping them secure is to use a “upside down figure of eight” so that the weight of the onion bulb is on top of the dried stem. Ensure that the onions have been left to dry and ripen but still have pliable stems. Remove any loose outer skins and trim off the roots. If necessary cut the stem to about 10cm (4in). The length of the string is not really important but remember that the more onions that you place n the string the heavier it will be - and you will have to lift it, to hang it up. A length of string about 1.6m (5ft) long is about right. Fold the string in half and tie a knot at the loose ends to fasten them together. To make working a bit easier, hang the string on the back of a door using a hook or bent out of a piece of wire coat hanger or whatever is convenient to give a suitable working height. Twist and form a loop in the bottom end of the string and place the neck of an onion in the loop. Tighten the loop around the neck. You will find that the onions own weight is sufficient to hold it in place. Cut off any excess stem to leave about 2cm (1in). Add a second onion by weaving the stem around the string as in the picture above - using a “upside down figure of eight”. Push the stem downwards and trim off any excess stem, leaving about 2cm (1in). The third onion is woven in from the opposite side of the string in the same way. As you push each onion down it will lock the previous onion in place. Continue adding onions from alternate sides until you reach the desired length. Stop when you have a comfortable weight to carry. If you have too much string left at the end, simple knot it at the required length to form a smaller loop and cut off the excess. Hang in a cool dry place to store - or hang them on your bicycle bars and ride round town! Choose an open, sunny site with good drainage which has preferably been dug and manured in the previous autumn. Stored seed viability: 1-2 years. Yield from a 10 ft row: 4kg (8lb). Stored seed viability: 1-2 years.